[Updated] The Police are investigating an incident at The Reefs staff dormitories in Southampton involving a Molotov cocktail early yesterday morning [Nov.9]. Sounds like someone at The Reefs is really pissed about the redundancies…. Hope the BIU and PLP understand the world is watching!! 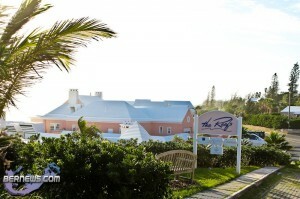 I certainly wouldn’t build a hotel in Bermuda with the way thinks are going. Especially if the voters reward bad behaviour and vote PLP back in power. This island is becoming more and more DISGUSTING!!! Another Bermuda interpretation of “Feel the Love”. If they’re not breaking into your room to beat you up they’re firebombing it. What a stupid thing to do.. Im sure that will bring tourist to the island.. People need to wake up sooner or later there will only be us bermudians left here with no one else to blame but ourselves. What a complety stupid comment.I would say incoherent at best and written with the skill of an 8 year old! Agreed , what a worldly idiot 80′s is .. Just ’cause they have it in the rest of the world we should too. I bet 80′s fool tells all their friends that Bda is a peaceful , loving paradise . Unmatched by anything else in the world ..
What’ll he do ? Simple . .He’ll tell ‘em even though they’ve never had it happen to them back home it’s still worse where they come from ! This has to be one fo the most ignorant , and unfortunately not uncommon , view points in Bda.. Some people just don’t know how to act. Our tiny island is on the brink of a huge abyss – one more thing and we could over the edge. You think you see redundancies now? Bermuda is quite simply self destructing before our eyes. Very sad that our island could come to this. I see a very bleak future. Well, before you all get your knickers in a twist, it was a ‘Guest House’. Probabley bad blood between the owner and someone else. Nothing stated or released to say it was occupied by guests et al. Terry, when they talk about a crime at a “guest house” it is almost always a hotel. Don’t be deceived into thinking it’s a small property. Thise break-ins at ‘guest houses’, they are major hotels. Remember that an act of arson cost tourist lives at the S Princess years ago. Don’t play with fire. Yes Chart, I remember the incident quite well. As I stated, we don’t know if the place was occupied and by how many. Let it go until police give further information. Quite simple but can have ramifications here and abroad if not properly edited, presented. @HMMMMM This is not a argument this is just they way I feel at this time. When I say the Systen Is Set these are lyrics from a true song so if you don’t understand what i am trying to say to my Bermudian Family I know they the understand where I am coming from so let it go. Well I’m part of your Bermudian family and I didn’t understand anything you said!! Hmmmmm, was correct, it would seem (from what you have written) you ARE your own worst enemy. Frain ann femilee ploy……..gotcha nah. Probably had something to do with the strike earlier this week. @t just so you know, I had a child under 12yrs old stand up and give me their seat on the bus this summer past and I’m in my early 20s. Yes, some of these kids are disrespectful as I’ve worked in summer camps and after school care. But they’re not all lacking in how to treat others. If people would take the time to give them time, we might not have such a problem as we do today. You can only lead sheep so far. You know the rest of the story right? We better to tell the few remaining tourists to stay well away from Bermuda then. Who wants to come to Bermuda and have your hotel firebombed in the middle of the night, be forced off your bike, have your handbag ripped from your shoulder or just beaten up by the ‘natives’ because they have an attitude about ‘foreigners’. With the cost of gas so high , why would anyone want to throw it away . There are some sick, pathetic, downright petty evil people walking around this island. How pitiful must you be to throw a molotov cocktail at someone’s residence at 1am in the morning. Take a good long hard look in the mirror and then examine your hateful heart. I stay praying for this island’s salvation. I’m wearing out my knees. Attempted murder must be the charge for whoever tried this. I swear Bermudians do it to themselves. What a bunch of f#kcing spoiled children! “Additional security measures ” does not mean “hires security”. There are far more options then just manpower. It takes a real LOW LIFE to do something like this! Seeing that the Molotov Cocktail was tossed at the staff quarters, can there be any doubt that this incident was meant as a message to foreign workers? How assinine can some Bermudians be…many of you won’t even apply for the service industry jobs because you perceive them to be “beneath you”; many that do apply and get hired are either micing away the day gossiping or talking on their cellphones, doing a half-arsed job or giving attitude to the public they’re meant to serve. And through all this you squawk when a foreigner comes in and performs these jobs willingly and with grace, grateful for the opportunity to earn a humble living thousands of miles from home. Well, keep it up you ungrateful yobs…soon there will be no jobs in Bermuda and you’ll be forced to go to another country to make a living. See how you’ll like it when the tables are turned. As a result of a substandard public education system and poor parenting many people cannot think things through rationally, critical thinking is essentially nonexistent, so their thoughtless actions often create unintended consequences… and unforeseen results. In other words; their dumb ideas backfire! It’s quite prevalent in local politics and union activities. And the firebombing is a perfect example of this thought process in action! While we clearly have significant problems, this conundrum is hardly unique to Bermuda or maybe you blame us dumb Bermudians for the melt down of the world’s economy or maybe it was Butterfield Banks Bermudian middle managers that caused it’s near collapse..
gotta get tougher in the courts!! they have a big influence on the law breakers!!!! To hell with the Courts! The cops should just bust they little asses! It’s called street justice. While this heinous crime was clearly committed by some heartless lost soul; how is it that we automatically jump to the conclusion that it was a disgruntled Bermudian who hates foreigners? I mean, it may very well be such an individual, but for all we know this could have been done by one foreigner aimed at another who slept with ther girlfriend. I know that the election is coming, but is everything negative in this island directly the result of politics and the ruling party? If it is, then where do we start laying blame; from 1998 or 1609? Neither this government or the previous administration has been perfect; o thonk the majority of us realize that. Rather than fire shots from the keyboard of an anonymous pseudonym, why dont we all step out into our 21 s.m. community and try to develop relationships beyond our comfort zone. Maybe then we can move forward together. I swear every article on bernews is predicated on race and anti political persuasions of one shape or the other. We will never succeed as a people if we all maintain this vitriol distrust and hatred of one another. Its so sad and it cuts both ways black and white. Marc, the suspicion that this could be Bermudians firebombing expats is because it was within 24 hours of a notorious work stoppage due to some Bermudians being fired, while others, including some expats, were not fired. A enormous issue was made about this. It’s all in the context of a week when there has been discussion of hate speech graffiti against asian expats in bus stops, and an asian expat having his bike set on fire. I know your first instinct as a defense attorney is to defend, but I think with the circumstances here it’s pretty obvious why the idea came up immediately. Asking “how is it” that this came up is disingenuous to say the least. Yeah, it could have been some other explanation. A bit like the two black men in dark visors who robbed a tourist last week ‘could’ have been expats or other tourists. @ Rick Rock – I fully understand and appreciate the position that you posted and I agree that the likely conclusion, based on recent events, would lead to a very sick and disgruntled bermudian. I was just trying to probe some thought as to how we analyze these reports, but I do agree with you on this one. I certainly don’t want to come across as disingenuous as I have been off the island and not fully tuned in with every news report of late. Ok, thanks Marc. I understand. I am sorry I used the word disingenuous, I was wrong about that. This was a disgusting and deplorable act. Wake up Bermuda, start using your heads!! I don’t condone putting Bermudians out of work and letting guest workers continue working. But, not knowing enough of the facts, one would assume that the persons let go were the least skilled and that those kept could perform their own duties as well as those who were let go. In these times a business has to keep versatile people who can do multiple tasks. If this was NOT the case then I believe those dismissed workers have a valid point and case, but something tells me its really as the article reported. BERMUDIANS, we need to educate ourselves CONTINUALLY!! No longer can we stand by and be one dimensional in the workplace. For example a truck driver ONLY drives the truck, a mason ONLY lays block, a linesman ONLY climbs a pole, etc. Those days have been gone for a very long time, when will we ALL realize this?!?. Since there assumptions being made about who throw the bomb I’ll put a guess in. Maybe it was a teenage child of one of the sacked workers that did it. Who knows, Christmas is coming and now that daddy or mommy has been laid off junior realizes that they won’t be getting any gifts or turkey dinner so their p’d off. If this was the case how dare one of these little SOBs do something like that. Don’t they know they’re all spoiled and non of them have to go to school without breakfast like kids in third world countries do. Must be the fault of the parents who are lazy good for nothing Bermudians who should be happy they don’t have to work more than one job to support their family. These Bermudians need to realize that gone are the days they could work a 9 to 5 job & get by. They must realize they are not getting a job unless they work 7 days a week even if they don’t get overtime for it. Also they should forget about getting paid enough to pay their expenses cause there are foreigners that will do the job for less. These foreigners deserve these jobs because these employers wouldn’t be able to pay off their overseas time shares if they had to pay these Bermudians to work. Besides foreigners do their job regardless the pay with an ear to ear smile Driving Miss Daisy style. Yes’m Miss Daisy I’d take you to the the Piggly Wiggly evry day fow seven dollars a month & I’ll do it with a smile. What a bunch of spoiled losers these Bermudians are. It’s not like they can’t find a job again they just need to start looking at some type of employment that requires little or no credentials. Maybe they should start applying to jobs at Paraquet Restaurant, Island Cleaning Services, The Spot Restaurant, Speciality Inn or one of the souvenir stores in town. Im sure they could get a job at one of these places.